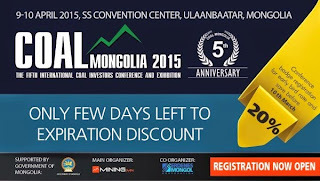 COAL MONGOLIA 2015 an International Conference and Exhibition on Mongolian Coal Market is celebrating its 5th anniversary with the support from the Government of Mongolia and main organizer MINING.MN and co-organizer Erdenes Mongol Corporation and is to be held on April 9-10, 2015 at the SS Convention Center. The increasing number of the foreign and domestic participants attending this event has proven that it has become one of the biggest coal market events in Asian region involving Government of Mongolia, government officials, investors, mining companies, equipment suppliers and internationally acknowledged research institutions. This year over 400 participants from over 10 countries have applied to take part at the conference and over 40 international mining companies have confirmed participation at the exhibition. As part of the conference on April 8, 2015 introductory trip to Mongolia’s biggest coking coal deposits at Tavan Tolgoi under Energy Resources LLC, Erdenes Tavan Tolgoi JSC and Tavan Tolgoi JSC will be organized. 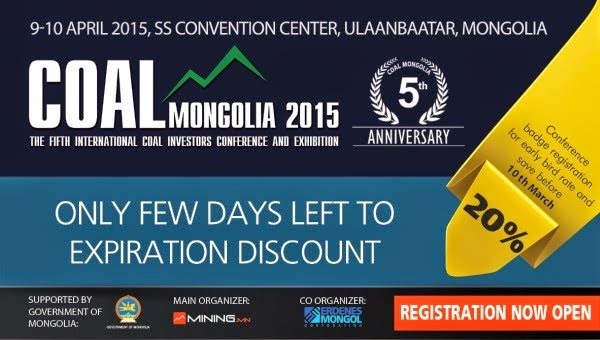 For registration for COAL MONGOLIA 2015 please visit ww.coalmongolia.mn or contact at telephone number 70115590.